Hindu philosopher and saint Akka Mahadevi was born at Udutadi in the Shivamogga District of Karnataka State, in southwest India to Sumati and Nirmalshetti, who were devotees of Shiva. They were the staunch followers of Hinduism's Trividhi philosophical school that accepted some Jain principles and rejected Hinduism's caste system. As a child Akka showed great interest in and devotion to religious practices. As an adult, she renounced the world and accepted the life of Sanyasin (Holy One/ saint). This was an unusual step for a woman and she was questioned extensively by Allamaprabhu and Kinnari Bommayya. Both questioned her actions and her decisions but she explained and defended them fully. She later settled in Basavakalyan, ("Kalyan") that was the captial of the Western Chalukya dynasty at the time. depicted here clothed only in her hair because she disavowed worldly possessions that divided people into castes and social classes. She is shown here standing on a lotus flower (indicating her arrival at the condition of moksha, or enlightenment. Akka Mahadevi is seen as representing the whole Vachana movement and she is clearly a major figure in the social empowerment of women. "She measured the heights of philosophical imagination, yet she did not remain content with the mere intellectual curiosity, she sought more and more a center of reference in God whom she approached through ardent love and devotion. She instinctively felt that man can never be fully and wholly fulfilled through self-discipline and knowledge, though self-discipline is arduous and knowledge superior. A more human approach to God lies through pure love and unselfish love which withdraws most of the obstacles that the ego interposes between the divine and the devotee." He is the one, the only one. He knows no birth and death. He is uncabined by caste or clime. All others fade away and die at last. I will have none of them. 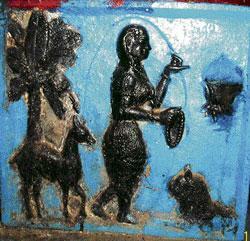 Recently a 13th century bas relief has been found of this important woman at the Lokeshwara temple in Gunjiganuru,.